Mythos Restaurant is one of two full service restaurants in Universal's Islands of Adventure (the other is Confisco Grille). The term full service means that the restaurant has table service instead of a quick service counter. At Mythos, you will be seated at a table, and a server will take your order and wait on you for the duration of the meal. 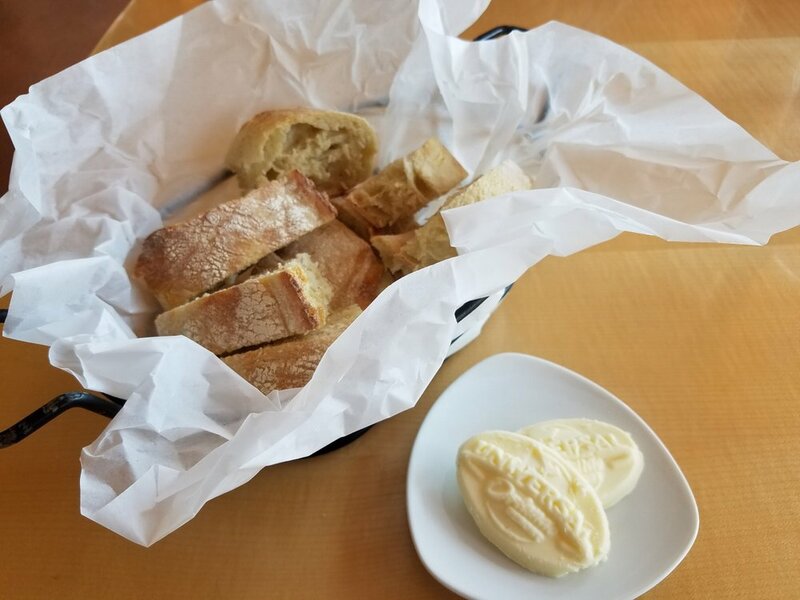 If you have a Universal Full Service Dining Plan, Mythos Restaurant is one of the places where you can get your full service meal. 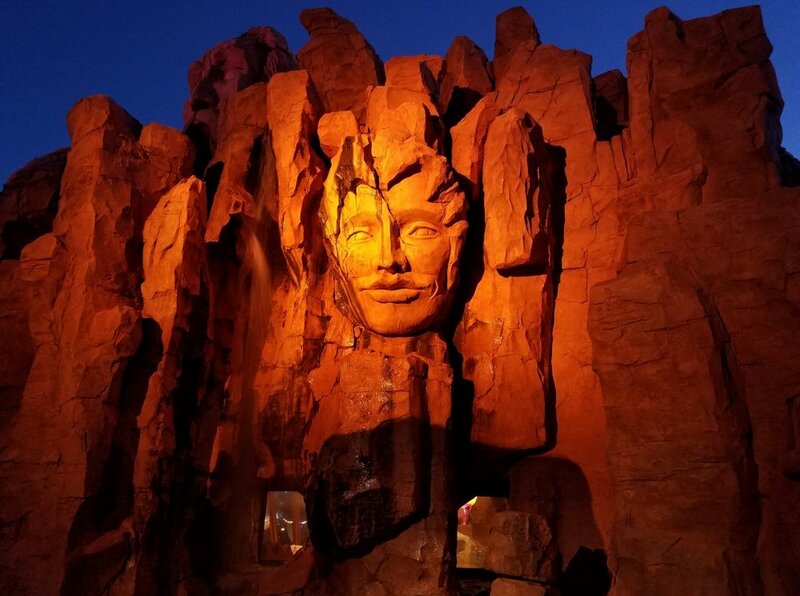 Between 2003 and 2009, Mythos was voted best theme park restaurant by Theme Park Insider, a fact that is proudly displayed on the exterior of the restaurant. Other restaurants have usurped this #1 status in recent years, but Mythos is still a good place to go if you are looking for quality theme park food or hoping to celebrate a special occasion. It is definitely the closest thing to fine dining at Universal's Islands of Adventure. Don’t worry about dressing up, though; there is no dress code. Mythos Restaurant is located in Lost Continent in Islands of Adventure. Look for the towering rock formations and waterfalls - you really can’t miss it. Mythos is a term used to describe a body of mythology, and that theme is certainly evident in Mythos Restaurant. The restaurant's designer, Jordan Mozer, based the theme primarily on two stories: the epic of Perseus (one of the most celebrated heroes of Greek mythology) and the story of Bellerophon (a hero whose greatest feat was slaying the Chimera). The exterior walls are designed to look like ancient rocks. Greek gods and heroes are carved into the exterior of the restaurant. Lavish waterfalls pour down the craggy rock face. There are also pools of water at the foundation. The interior is equally impressive. This cavernous space also looks like it was carved out of rock. 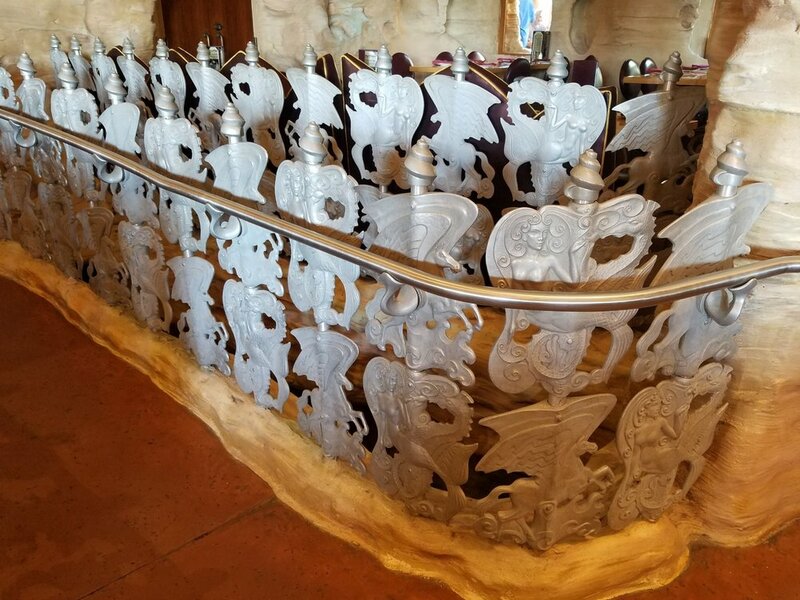 Representations of the Chimera, water nymphs, and the three brother kings of the seas (Phorcys, Nereus, and Thamus) are present in the restaurant.The River Styx also runs through the middle of Mythos. In Greek mythology, this river served as the boundary between Earth and the Underworld (Hades). Perseus crossed this river in his quest. The back of the restaurant has really tall windows that look out onto the interior lagoon of Islands of Adventure. From these windows, you get a good view of other areas of the park, including The Incredible Hulk Coaster and the rest of Marvel Superhero Island. Mythos also has an outdoor patio with beautiful views of the park. Part of the back exterior of Mythos Restaurant. Part of the Mythos Restaurant exterior at night. The cuisine at Mythos Restaurant is best described as Mediterranean. Many of the dishes contain olives, grapes, feta cheese, tomatoes, and other classic Mediterranean foods and flavors. There is also a full wine list. If you don’t enjoy Mediterranean flavors, don't worry; there are dishes on the menu for you, including a traditional hamburger, pad thai, and a grilled chicken sandwich. There is also a special menu for kids with lower prices and less exotic foods. If you have special dietary needs, Mythos is a good place to go. More than half of the menu items can be prepared gluten-free. There are also several vegan dishes on the menu. Food prices at Mythos are a little higher than they are at some of the other restaurants in Islands of Adventure. If you have six or more people in your party, an 18 percent gratuity will be added to your bill. Universal annual passholders can get 10 percent off food and non-alcoholic beverages with a Preferred Pass and 15 percent off with a Premier Pass. *Menu last updated January 2018. Items marked with (GF) are gluten-free. Items marked with (V) can be made vegetarian. Reservations are not required for most of the restaurants in Universal Orlando. 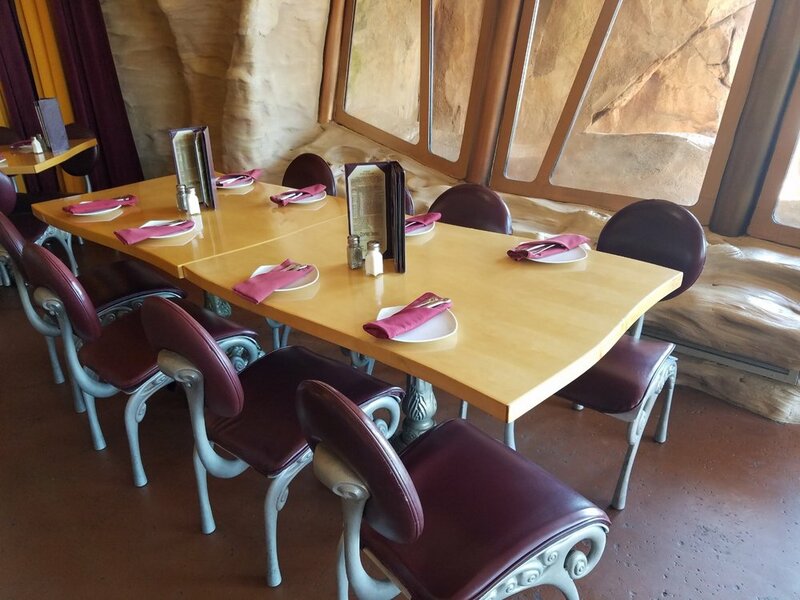 However, we highly recommend making reservations for Mythos Restaurant to ensure that you do not have to wait for a table - especially if you choose to eat during common meal times (12:00 p.m. - 2:00 p.m.; 4:00 p.m. - 7:00 p.m.). 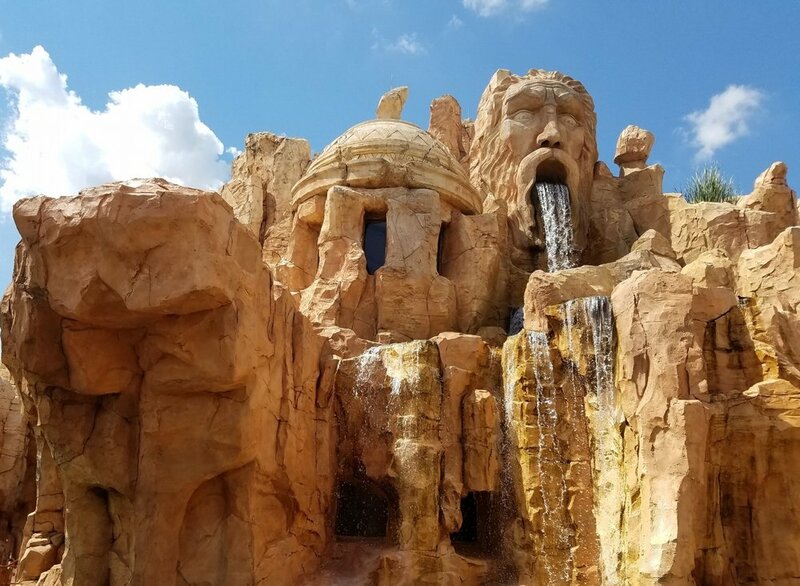 You can make Mythos reservations online or by calling Universal's Islands of Adventure Reservations hotline at 407-224-FOOD (3663). If you are celebrating a special occasion or if you have a seating preference, you should note it while making the reservation. One of the brother kings of the seas carved into the interior of Mythos Restaurant. One of the seating areas in Mythos Restaurant. We enjoy dining at Mythos Restaurant. The food here is a bit better than the food in many of the quick service restaurants in Islands of Adventure. The menu isn’t huge, but it does offer a nice variety of dishes. While the food is good, the setting is even better. The interior and exterior of this restaurant are simply stunning. There is no place quite like it in the theme parks. Guests frequently stop to stare at Mythos as they are walking though Lost Continent. We think that the front of Mythos is one of the best photo ops in the park. If you don’t want to have a meal here, you should at least visit for drinks, an appetizer, or a dessert. This will give you a chance to walk around the inside of the restaurant and see the unique decor. 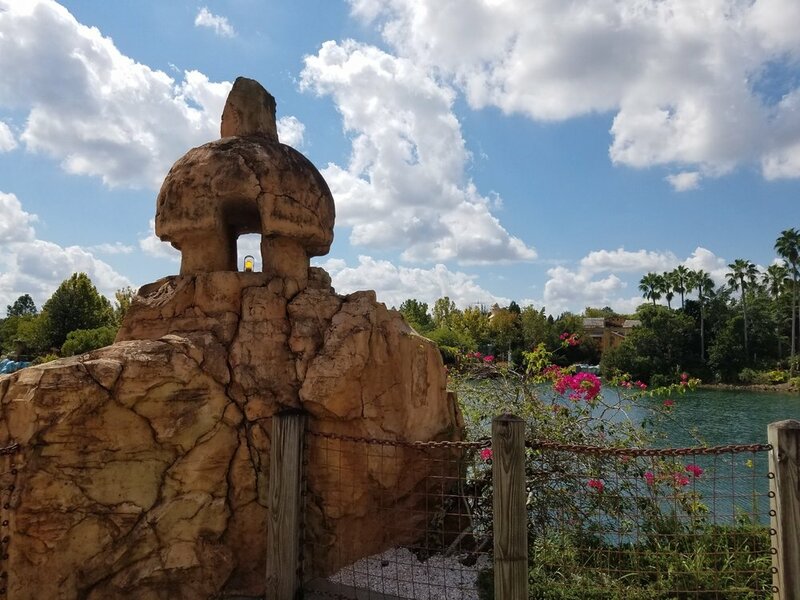 Before you leave, make sure you walk all the way around the outside of Mythos to get a good look at all of the carvings. When you're behind the restaurant, you'll have a great view of the park. 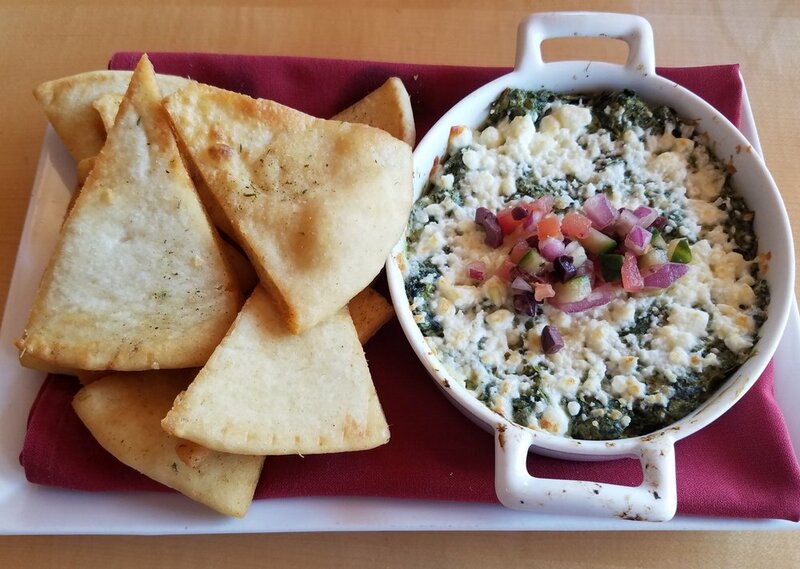 We highly recommend the Spanakopita Dip, which is a savory blend of spinach, feta cheese, lemon and fresh herbs, served hot with fresh pita chips seasoned with za'atar spice, with fresh cucumber, tomato and olives. This is a very tasty and sharable appetizer. It could also work as a small meal for one person. If you like sandwiches, The Pressed Porchetta Panini is a good choice. This sandwich comes with Italian roast pork, apple butter, grilled red onion, fontina cheese, arugula and grain mustard. There isn’t a lot of meat on the sandwich, but the flavors blend nicely. The Traditional Hamburger at Mythos is a safe choice for people who want something simple. 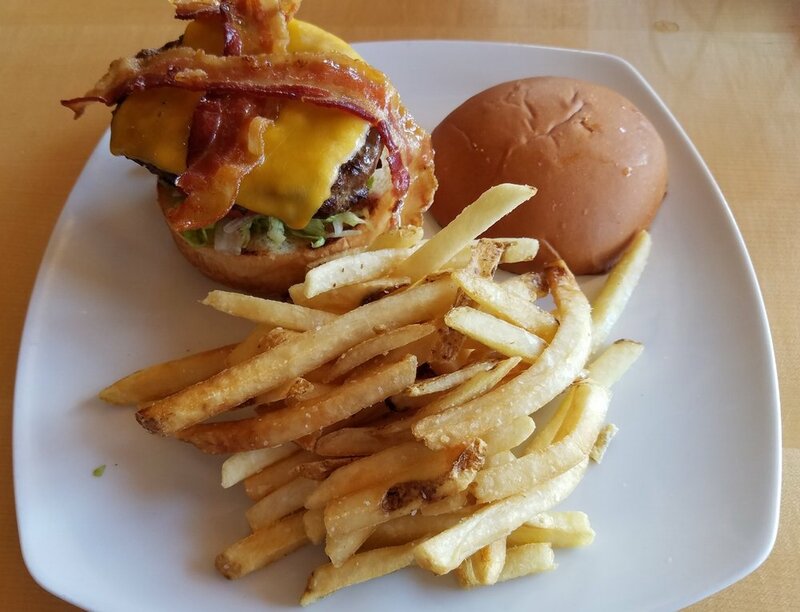 This burger recently made the list for our favorite burgers at Universal Orlando Resort. Spanakopita Dip from Mythos Restaurant. The Traditional Hamburger with French fries at Mythos Restaurant. 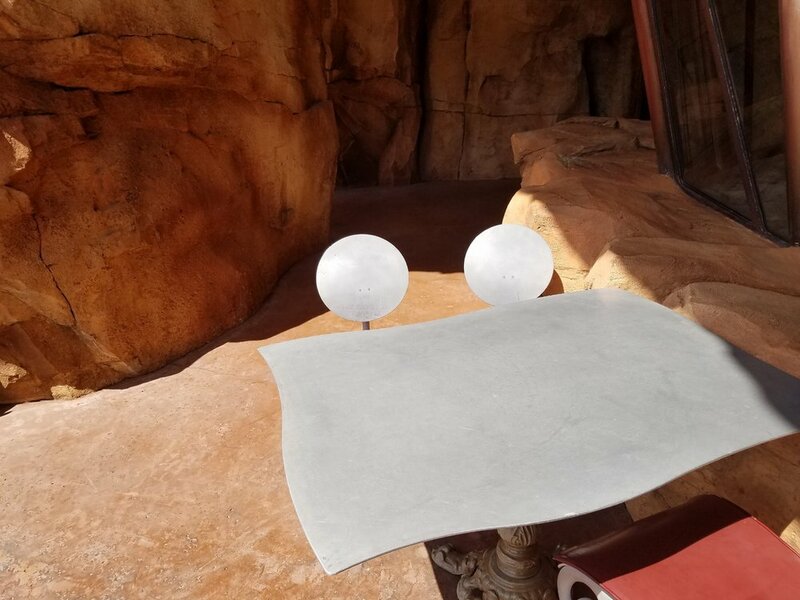 Mythos Restaurant does not have a bad seat, but our favorite seats are located near the back of the restaurant by the tall windows that overlook the park. When we make our reservations online, we request "seats next to the window with a view of the park" in the reservation notes. We also like to make our reservations for 11:00 a.m., which is when the restaurant typically opens; this increases our chances of getting the seats we want. The outdoor patio behind the restaurant is also a nice place to sit and get a good view if the weather is good. The Mystic Fountain - This mischievous water fountain sings, tells jokes, poses trivia questions, and interacts with guests. Look for it in Sindbad’s Bazaar near the entrance of The Eighth Voyage of Sindbad Stunt Show. Poseidon's Fury - This is a walk-through special effects attraction that takes place inside the crumbling Temple of Poseidon. Look for showtimes near attraction entrance. The Eighth Voyage of Sindbad Stunt Show - This 20-minute show features heroes, a princess, an evil sorceress, choreographed stunts, and special effects. Look for showtimes near attraction entrance. This Mythos image gallery features pictures of some of the food as well as the inside and outside of Mythos Restaurant. Served with butter that has been stamped with the Universal logo. Spinach, feta cheese, lemon and fresh herbs. Served hot with fresh pita chips. Italian roast pork, apple butter, grilled red onion, fontina cheese, arugula and grain mustard. Served with French fries.